Dining at the Kimmell House Inn is a event to remember. Whether you are stopping by for a quick pastry and delicious handcrafted mocha to go, or meeting friends for a leisurely lunch, the casual elegance and unique setting of the Kimmell House Inn will amaze you. For a special night out, evening dinners at the Kimmell House Inn Restaurant are relaxed, quiet, and all about comfort food. What started out as our desire to offer some sweet baked goods and fabulous coffee quickly escalated when we open our bistro in 2005. Originally housed in just two rooms downstairs, we eventually remodeled and redecorated the entire downstairs of this elegant Victorian home to house our restaurant. Enjoy your meal in the Parlor with our hand-painted ceiling, or the Sitting Room, where you can gaze out the beautiful bay windows. You can sip iced tea on the porch and listen to the relaxing fountain, or lounge in the gazebo and enjoy the gardens. You can browse our gift shoppe, featuring our favorite Republic Teas, tea pots, delicate tea cups, and much more- quaintly situated in the former office of the original owner, Orlando Kimmell. At the Kimmell House Inn, we are open to the public seasonally, and offer breakfast, lunch and dinner, as well as specialty coffee and teas. While we do not require reservations for breakfast or lunch, it is advisable to call ahead, as we do have limited seating and seasonal hours change. Reservations are needed for evening dining, and we require a minimum of 10 people per party. We can easily host business luncheons, baby or bridal showers, birthday or anniversaries celebrations and club meetings. Contact us with questions or to schedule your event. 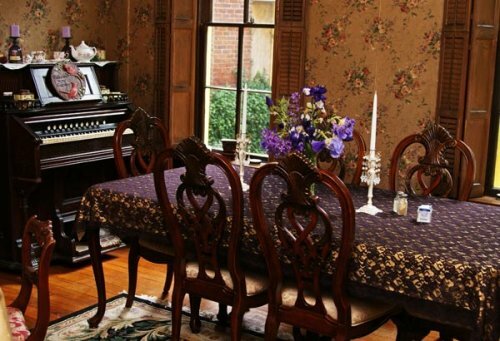 Enjoy a special day with your family at the Kimmell House Inn- a delicious, made from scratch dinner, perfect for gathering together and celebrating spring!